Posted on September 11, 2014 by Hawaii's Local Buzz. September has arrived, and it’s National Honey Month! If you’re a fan of honey, there has never been a better time to drizzle this sweet creation over your food. This year, why not celebrate by finding new ways to use our raw honey from Hawaii in your diet and cosmetics? Unlike white sugar, honey offers numerous benefits for health and wellness. Honey has antibacterial properties, and it can boost your immune system. It’s also great for applying to wounds to prevent infection. 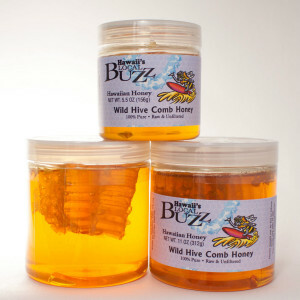 Using honey in your hair can give it wonderful moisture and nourishment. Raw honey from small, local producers is not laden with pesticides or heavy metals. You can use honey as a face mask to add moisture back to your dry and damaged skin. It’s a little sticky, but completely natural — and you don’t have to worry if you accidentally get a little in your mouth. Pick up some of our Wild Hive Honey to celebrate National Honey Month! In addition to being good for you, purchasing honey is also good for the bees. Your money goes towards supporting beekeepers who have dedicated their careers to ensuring that the honeybee population stays robust and healthy. Without honeybees, many plants would not be pollinated, and we’d lose many of the delicious fruits and veggies that we love and rely on for survival. Each variety of honey has its own taste sensations, so experiment using different ones in your cooking. Use our raw honey from Hawaii as a pre-workout energy booster, to add flavor to home-baked goodies, and to help fight off seasonal allergies. Hawaii’s Local Buzz is proud to bring you macadamia nuts, honey, coffee and other great snacks from the tropical Hawaiian islands. Visit our website for more information about our high-quality products. Have a happy Honey Month!